According to a recent Al Jazeera report, India has deported at least 1,300 Rohingya refugees since December. The United Nations has accused Myanmar regime of genocide against the persecuted Muslim minority. And according to Prashant Bhushan, a Supreme Court lawyer, there has been a campaign by Hindutva groups to create an impression that these refugees are terrorists. And these Rohingya refugees have described a campaign of fear mongering, harassment and intimidation by the Indian government. But according to the government, those fleeing Myanmar have ties with militant groups. And some of them can be traced back to Pakistan. These refugees being unwelcome in India is hardly a surprise. The Indian government shares good relations with the Myanmar regime, and Prime Minister Modi stood with Aung San Suu Kyi at a time when the world was beginning to question the Nobel Peace Prize winner over her handling of Rohingya crisis. And of course, Modi would be the last person to highlight Myanmar army’s gross mistreatment and abuse of the Muslim minority. After all, we are continuously witnessing the use of excessive force and Human Rights violations by the Indian armed forces. A government that oppresses people demanding for self-determination can neither be able to defend other people under oppression, nor will it feel the moral obligation to do so. But what was interesting in the Al Jazeera report was the link made between Rohingya refugees and Pakistan. India’s obsession with Pakistan is laughable and disturbing at the same time. India has developed a fixed mindset where Pakistan is responsible for everything. Their paranoia is such, they are willing to believe that Pakistan is recruiting displaced Rohingyas to create havoc within India. The Indian government can label their decision to reject Rohingya refugees as a matter of national security, but it stems from the right-wing government’s hatred for Muslims, as well as its insecurities and paranoia towards its neighbour, Pakistan. But more than anything else, the comments made by BJP spokesperson Nalin Kohli highlight an even bigger issue. 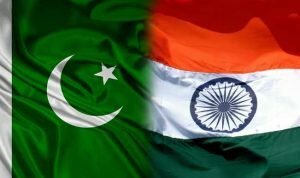 India has always used Pakistan as a scapegoat, whether it is anything related to internal issues, or the freedom movement within Kashmir, India has always blamed Pakistan, and has used its position on the world stage to malign Pakistan in every possible way. Pakistan’s international image, unfortunately, leaves a lot to be desired, and that works in India’s advantage. India in recent times has successfully built a narrative that stands firmly against Pakistan, constantly making it look like the bad guy. The Indian government on all platforms has projected itself as a victim of terror at the hands of Pakistan, even though Pakistan as a nation has lost thousands of lives due to terrorism. But India shamelessly glosses over its gross Human Rights violations in Kashmir, showcasing itself as a progressive government for everyone, although it is driven by a divisive, Hindu nationalist agenda. And despite Pakistan’s negative image abroad, the irony is that the people have never elected an extremist government, driven by a right-wing religious agenda. India, on the other hand, despite being the largest democracy in the world, has voted in a man with a bloody past. Since coming to power, Pakistani Prime Minister Imran Khan has maintained that he seeks good relations with all neighbouring countries, and that includes India. His government has made several attempts to reach out to Modi Sarkar, but without success. Imran Khan has always maintained that peace and stability is in the best interest of the entire region, as well as Pakistan and India. However, India seems to be more than happy with fanning the flames of hatred and enjoys playing blame games with Pakistan. And this is something that Imran Khan must understand now. His desire for peace has not been embraced by his counterpart, and Pakistan alone wanting to improve relations is of no use. And by ridiculously linking the situation of Myanmar with Pakistan, Modi’s government has made its intentions very clear. Any talks for peace seem far off from here.